How I Built This is an American podcast about "innovators, entrepreneurs, idealists, and the stories behind the movements they built" produced by NPR. How I Built This began on September 12, 2016 as a podcast where the host, Guy Raz, talks to innovators, entrepreneurs, and idealists, about the stories behind the movements they built. ^ "NPR Debuts 'How I Built This With Guy Raz'". NPR Press Room (Press release). NPR. Retrieved 27 September 2016. ^ Bridges, Frances. 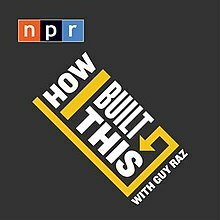 "NPR's Guy Raz On Faking His Way To Success, And His New Show 'How I Built This'". Forbes. Retrieved 24 November 2016. ^ "How I Built This with Guy Raz". NPR. Retrieved 2017-01-02. This page was last edited on 21 February 2019, at 21:18 (UTC).